As we approach the turning of the year, I thought it would be the right time to reflect on how 2014 has been for me and set myself some intentions for 2015. 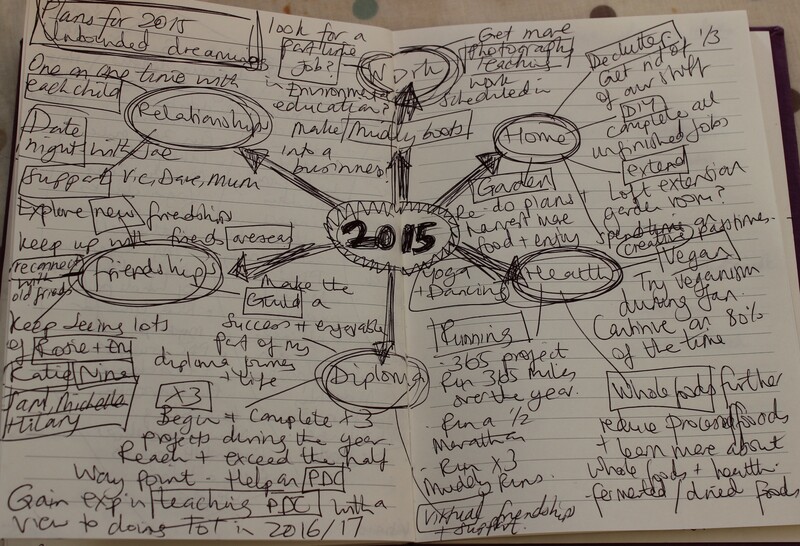 In January 2014, I spent some time planning my diploma journey and considering new years resolutions and things I wanted to achieve. I divided these into eight categories; home, family, friends, health, work, diploma, leisure and other. My planning is detailed in the image below, the ticks indicate what was achieved. I did manage quite a lot of the things on the list, but various tasks were left unstarted or uncompleted due to lack of time, money or energy. 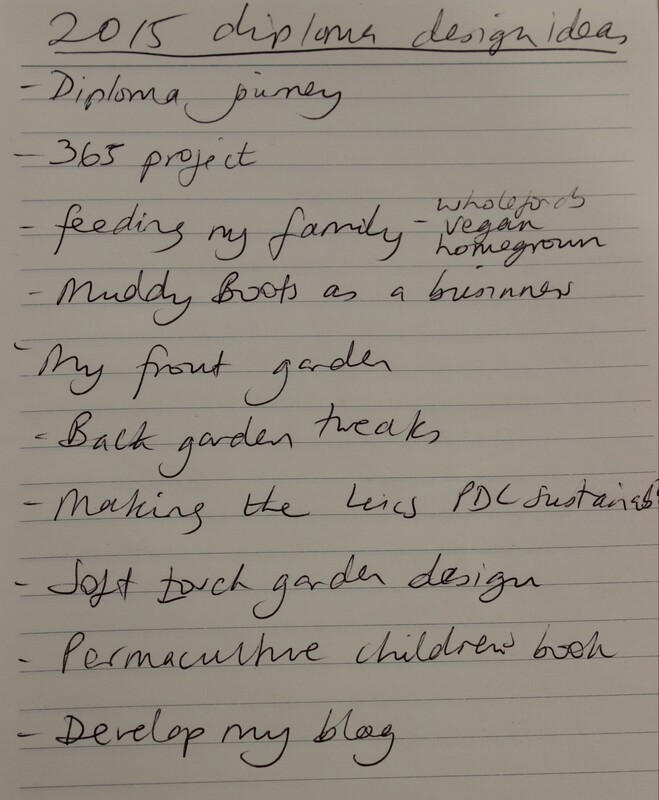 These tasks will be carried forward into 2015 and are listed under ‘next achievable steps’ at the bottom of this post. 2014 was a great year overall, we had lots of happiness, three close friends had new babies, as did my sister and her partner. My brother’s jobs went well, my mum enjoyed her retirement. Joe got on well at work and his company will be moving to a larger premises early in the new year. My eldest is getting on well at school and is enjoying her hobbies, especially cross county running. My middle daughter started full-time school, which caused us lots of anxiety but she settled quickly and loves it now. She has a ‘Frozen’ obsession which has been fun! Little S is becoming a real rough, tough boy now, obsessed with trains and tractors. He is very loving and fun to spend time with. I have been surprised by my new-found love of running this year. I have just completed 100 miles since I began recording my runs back in August. I am proud of myself and have seen my fitness improve dramatically. I took part in a Muddy Run and enjoyed it immensely, so have signed up for another in March. It’s lovely to have this hobby in common with my marathon running husband. I have taken part in a 6 month on-line course in health and nutrition. I have learnt loads about whole-foods and have made some positive changes in our diets. My diploma continues to be a big part of my life. I work on it almost every thursday and enjoy writing up my thoughts and activities on my blog. I have helped out on the local PDC and intend to take an even more active role in 2015. I looked at one permaculture Principle each month, which was great and taught me a lot. As always, the difficulty come in allocating my time and finding the balance between managing family life and finding opportunities to pursue my own interests and diploma work. Walking out the door is difficult, the parent guilt is a killer. however, I do feel I have found a slightly better balance this year. I almost always have one day a week 10-2.30 free, without my children to work. I have also fitted in a regular exercise class one a week and frequent runs either early morning or afternoon when was OH is around. As my children grow up, I think this balance will settle more and more. As I am still breast-feeding little S, nights out or sleep-overs are not possible, but by this time next year I expect this will have changed again. I find not having any money OK most of the time but occasionally stressful. I would quite like to take on a little more work in this coming year, either photography teaching, making Muddy Boots into a business or something else that has not yet presented itself to me as a opportuniy. I am open-minded and would quite like to try something new. The constant clutter and housework gets me down. I don’t enjoy it and resent how much of my time is taken up with moving things from place to place. I did a lot of de-cluttering in 2014 and plan to do even more in 2015. I want the children to use and value what they have rather than being over-whelmed by stuff and not realising how lucky they are. What are your long-term goals and visions? 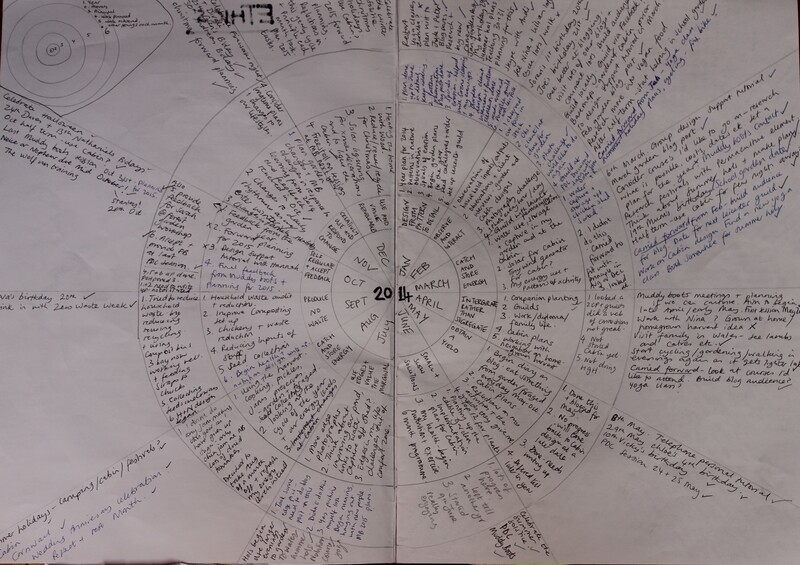 This brainstorm shows my plans for 2015, lots of the themes from 2014 arise again! 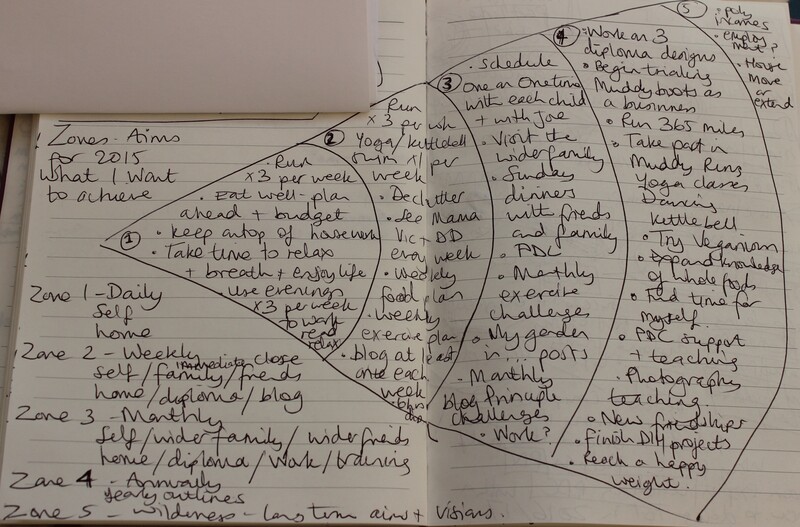 I decided to use the permaculture tool of Zones and try laying out my aims for 2015 in terms of Zones. Zone 5 Long term plans and visions and steps taken towards these. * Arrange more one-to-one time with each of my children and my husband. * Organise my photography teaching notes/ resources so workshops are easier to plan. * Attend workshops to learn new skills in areas that interest me. * Look into Forest schools training and TOT training. * Spend less time using screens! Reduce Facebook/ internet/ I-player/ Netflix usage and encourage my OH and children to do likewise. * Further de-cluttering of the house. *Work on my diploma and aim to complete three additional designs during 2015. 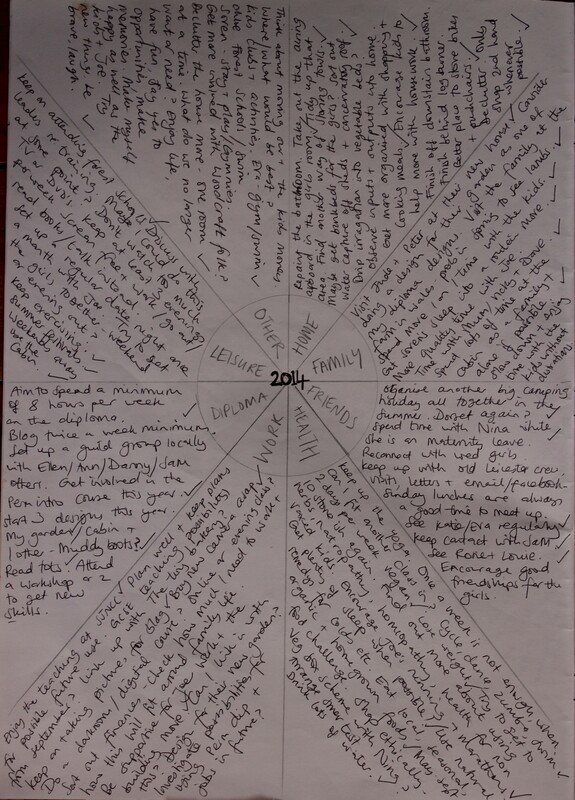 This entry was posted in Uncategorized and tagged Diploma journey, New year's resolutions, Permaculture, Permaculture Diploma, The four questions, ZONES by emilycrofton. Bookmark the permalink. 2015 will be another pro-active, positive and progressive year. Well done on all your achievements in 2014 sis.